Just as your fate can be identified through your astrological chart, your name carries this same insight. In ancient times, names were given in keeping with the native's prospective path in life. The family's status and financial standing were the factors influencing names. The knowledge of planetary influences was wisely delegated to students and scholars who chose this as their life's work. The wise men (astrologers, Rabbis, spiritual counselors) availed themselves of an additional vehicle that carried this same insight. It was valid then, and it is valid now - "the name you carry". This art/science is called ACROPHONOLOGY. The Bible makes many references to the validity of name changes. Example: Saul was a man of violence until he changed his name to Paul. Another reference to a miracle brought about by a name change was Abram and his wife, Sari. Though they were well past the age of fruitful procreation, the Lord told him that Sari would bear him a son. When Abram questioned this miracle, he was told to change his name. He became Abraham. she became Sarah, and indeed, she bore him a son and named him Isaac. Many of the gods in mythology refused to reveal their true names for they knew that knowledge of their names would give their enemies insight that could be used against them. Even today in the Jewish culture, a Rabbi is called upon to change the name of a seriously ill person. The theory being that a new name grants new energies - new life. Originally, the custom of naming a newborn after a particular person was to bestow these same attributes to the newborn . . . an honor to the person . . . a gift to the new soul. Every astrologer knows only too well that there is order in the universe (placement of the planets). Initials carry this same energy and this same order. ACROPHONOLOGY is only another language of astrology - a tool to further insight. Shirle studied over 10,000 charts and noted a correlation between paramount planets in a chart and letters in a name. The letter influences in a name act in accordance with astrological rules. On a cursory basis, the first (given) name acts as an ascendant denoting personality traits, while the mother's maiden name carries the same influence as the I.C. All your names relate to different house positions. The following is a brief example: The name born with was Sarah. Astrology helps teach ACROPHONOLOGY, and ACROPHONOLOGY makes for a more insightful astrologer. You have often seen twin charts (those born at the same day, place and time), yet they have different personalities. You will find the difference in the name. In astrology, you cannot negate any planetary placement. In ACROPHONOLOGY, you cannot negate any of the names the native carries. Although placement alters the influence (akin to squares, trines, and oppositions), the following is a list of the letters and their assigned influences. Review your own chart or those of a client and note for yourself the influences. ACROPHONOLOGY can easily identify the karma, hang-ups, relationships with parents, insecurities, along with the personality you outwardly manifest, as well as the deep rooted traits you find difficulty in releasing. Any astrologer who is familiar with current transits can be as predictive with the name as s/he can be through the zodiacal chart. ACROPHONOLOGY is only another simplified language of astrology. 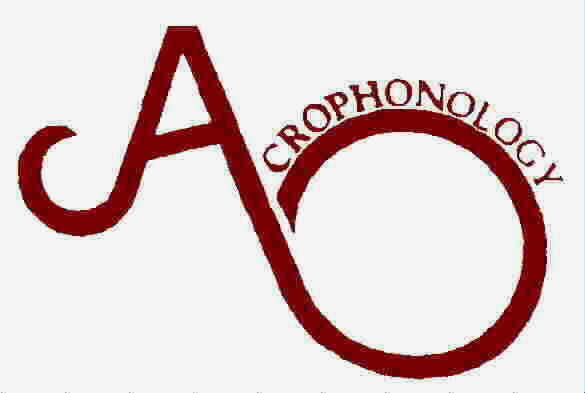 You need not be an astrologer to become and Acrophonologist, but ACROPHONOLOGY can make you a more astute astrologer. Shirle Kiley, an astrologer for over 50 years, correlated the energy value of the planets to the letters of the alphabet.